I have learned many things during my marathon training, and one of the things I learned early on is that along with eating the right amount of calories, I also needed to eat the right amount of fats, carbs and protein too. I recently bought these from Whole Foods and they ROCK! They are great before and after a long workout, the only downside being they do leave you feeling a bit thirsty afterwards. I ate the chocolate chip version an hour before my 4mi run and noticed a BIG differance in energy. I ran my fastest 5K just shy of 27 min. It also gave me energy for my 6.6K trail walk the same day. No matter what type of workouts you do, it's important to be properly fueled. 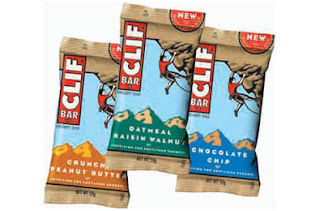 I'm glad I found CLIF energy bars . So far the chocolate chip and almond fudge taste great, and they all offer amazing benefits that will help you get through, or recover from your most intense workouts.